That's Another Story: A SQUIGGLY STORY by Andrew Larsen & Mike Lowery - A book to encourage young writers! 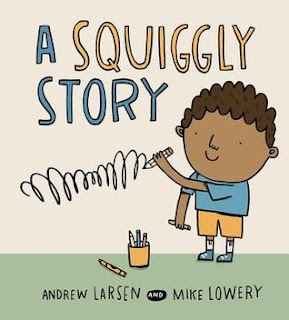 A SQUIGGLY STORY by Andrew Larsen & Mike Lowery - A book to encourage young writers! After I read this book, I wanted to read this to my kindergarten students right away! I loved the way it recognized their beginning stages of writing. This book was one of the nominees for the Blue Spruce Award from The Forest of Reading in 2018. So the boy tries. He writes a letter. An easy letter. The letter I. And from that one skinny letter, the story grows, and the little boy discovers that all of us, including him, have what we need to write our own perfect story. A Squiggly Story was written by Andrew Larsen and illustrated by Mike Lowery. It was published by Kids Can Press in 2016. My sister loves to read. Page after page, word after word. My sister loves to write. I liked the way this story showed the writing process. The emphasis on the ideas in the story, rather than the mechanics of forming the words, showed how imagination plays a huge role in storytelling. I also liked the way the author showed the boy listening to the suggestions of other children, thinking about them and then sticking to the ideas that fit the story he wanted to tell. The comic style illustrations are cute! This is a wonderful book to encourage beginning writers, including even very beginning writers who can tell a story but can’t write it down themselves. I really liked the way squiggles and zigzags were shown as a way to help tell a story. The book nicely explains that a story needs a beginning, middle and an end, and shows how to brainstorm ideas. A great book to have in a primary classroom. Write your own squiggly story! Make a list of ideas for different ways to end the boy’s story. Which ending would you choose? What is your favourite “big” word? Your favourite “little” word? Can you draw a story that includes your words? What a important way to help children begin to write/tell a story. There are no right or wrong ways. I like how the story encourages individual creativity. Love your thoughts about using this book with children and your activities. I remember years back when my daughter watched me write stories. She once told me she had a story she wanted to write, too. She took a pencil and make squiggles across each line, and when she had filled her page, she invited me into the living room to take a seat and listen. I'm going to check out this book from the library because I know it will bring back a wonderful memory in my home. What a great idea for a story! And so spot on, developmentally. Thanks for highlighting!